The Whitefield Players present Passport to the World: Horfield URC, Bristol. Community theatre, in the true sense, can take many forms. Sometimes it’s a lavish presentation of a well-known work involving hundreds of people. On other occasions, like this one, it has been put together club members hoping to make the best use of the talent around them. As the show’s title suggests, we were taken on a world cruise in words and music in a show written, produced and directed by Tracy Rogers and Tim Scaplehorn. This format gave musical director Loretta Hedges a chance to raid many famous shows and films, as well as mixing modern numbers with the old George Formby favourite Mr Wu. Most of the 29 people on stage has a chance at one time or another to step into the spotlight in either one of the musical selections or the original comedy sketches. There were several good solo inputs but the real strength lay in the teamwork. The Miss Saigon sequence, which ended in an attempt to reproduce the spectacular helicopter landing, involved all backstage teams as much as those on stage. When given the opportunity the audience also readily became part of the team. As son as they were invited to they joined in American Pie with relish, helping to bring this True Brit Community Theatre to a rousing conclusion. A drama group from Horfield is putting on a production of Sleeping Beauty this week. The Whitefield Players at the Horfield United Reformed Church, also known as the Whitefield Memorial Tabernacle, based in Muller Road will be staging the pantomime from Wednesday until Saturday. The group has 30 members ranging in age from one to 70. The young Sleeping Beauty is played by one-year-old Katie Rose – the granddaughter of director Tracy Rogers. The older Sleeping Beauty is to be played by 15-year-old Katherine Legg, who is from Horfield. Spokesman and chorus member Alison Kinnersley, from Horfield, said: “This is our fifth pantomime and we though that performing Sleeping Beauty would be a bit of fun. The show starts at 7.30 and tickets, priced £4 for adults and £3 for concessions, are available on the door before performances. 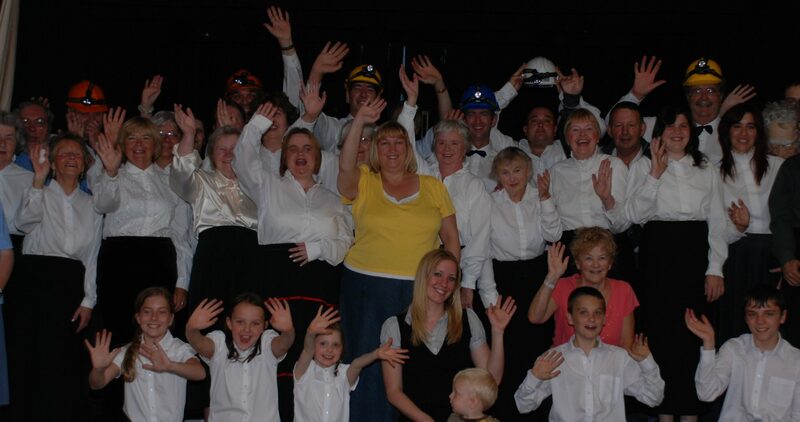 A grant of £1,000 from a local community fund will help a north Bristol drama group store their costumes and sets. The Horfield-based Whitefield Players perform and rehearse their popular plays at the Horfield United Reformed Church, which is also known as the Whitefield Memorial Tabernacle. They are set to benefit from the Let’s Make It Happen fund, a collaboration between Combined Insurance and the Observer’s sister paper the Evening Post. The fund gives away £10,000 a year to a broad range of individuals, groups and charities to benefit the community at large. The Whitefield Players, who have 30 members aged from five to 70, plan to put the money towards a £5,000 double-door storage garage. Spokewoman Alison Kinnersley said: “We’ve got a bit of a storage problem. “We can’t keep using the church because we’ve got too much stuff. “We want to buy this garage and use one side for the costumes and the other for decors and sets. Clive Robbins, managing director of Combined Insurance, said: “We’re extremely delighted that the community awards are having such an immediate and positive impact on local communities in the Bristol area.